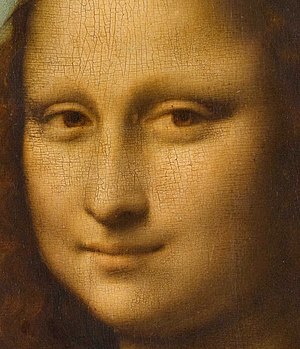 Detail of the face of Mona Lisa showing the use of sfumato, particularly in the shading around the eyes. Look up sfumato in Wiktionary, the free dictionary. Sfumato (Italian: [sfuˈmaːto], English: /sfuːˈmɑːtoʊ/) is a painting technique for softening the transition between colours, mimicking an area beyond what the human eye is focusing on, or the out-of-focus plane. Leonardo da Vinci was the most prominent practitioner of sfumato, based on his research in optics and human vision, and his experimentation with the camera obscura. He used it in many works, including the Virgin of the Rocks and in his famous painting of the Mona Lisa. He described sfumato as "without lines or borders, in the manner of smoke or beyond the focus plane". According to the theory of the art historian Marcia B. Hall, which has gained considerable acceptance, sfumato is one of four modes of painting colours available to Italian High Renaissance painters, along with cangiante, chiaroscuro and unione. The word "sfumato" comes from the Italian language and is derived from "fumo" (smoke, fume). "Sfumato" translated into English means soft, vague or blurred. In Italian the word is often used as an adjective (like "biondo sfumato" for pale blonde hair) or as a verb ("l'affare è sfumato" would mean the deal has gone up in smoke). The use of the term (unlike some others) dates back to the period. The technique is a fine shading meant to produce a soft transition between colours and tones, in order to achieve a more believable image. It is most often used by making subtle gradations that do not include lines or borders, from areas of light to areas of dark. The technique was used not only to give an elusive and illusionistic rendering of the human face but also to create rich atmospheric effects. Leonardo da Vinci described the technique as blending colours, without the use of lines or borders "in the manner of smoke". Besides Leonardo and his followers the Leonardeschi, who often used it heavily, other prominent practitioners of sfumato included Correggio, Raphael and Giorgione. Raphael's Madonna of the Meadow is a famous example, particularly around Mary's face. The Leonardeschi include Bernardino Luini and Funisi. ^ Earls, Irene (1987). Renaissance Art: A Topical Dictionary. Greenwood Press. p. 263. ISBN 0-313-24658-0. ^ Hall, Marcia B. (1994). Color and Meaning: Practice and Theory in Renaissance Painting. New York, N.Y.: Cambridge University Press. ISBN 978-0-521-45733-0. ^ "Four Canonical Painting Modes by APA". . Retrieved June 18, 2015. ^ "Sfumato". Art Painting Artist. Wikimedia Commons has media related to Sfumato. This article related to art techniques is a stub. You can help Wikipedia by expanding it. This page was last edited on 5 September 2018, at 04:55 (UTC).